Clear finishes protect wood from wear, moisture, and aging, but they can degrade the environment—in your home and elsewhere. This overview provides in-depth comparisons of Lacquer, Natural Oil, Shellac, Varnish, and Water-based clear finishes. Alex Pennock wrote this article, with contributions from Marian Keeler and Willem Maas. Clear finishes protect wood from wear, moisture, and aging, but they can degrade the environment—in your home and elsewhere. When selecting a clear finish for wood finishing or refinishing, we recommend considering the environmental impact of its manufacture and disposal, its effect on indoor air quality, and its durability. The environmental impact of clear finish manufacture and disposal ranges from high (for the energy-intensive and polluting manufacture of petroleum-based solvents) to low (for the extraction of natural oil from tung tree nuts). All clear finishes must be disposed of as hazardous waste, so it’s best to buy only the amount you need. For a comparison of specific products, see The Green Guide's Wood Finishes Buying Guide. Like paints, clear finishes can contain high levels of volatile organic compounds (VOCs), which contribute to air pollution and can cause health problems. (See About VOCs for more information.) Finishes can have a greater effect than paint on your home’s air quality, however, because they must be reapplied more frequently on high-use surfaces like floors, tables, and chairs. Toxic and polluting ingredients such as toluene and xylene are common solvents; carcinogens such as arsenic, beryllium, and cadmium are sometimes used as drying agents in linseed oil; and toxic glycol ethers may be used as solvents in many water-based sealers. All clear finishes are made of a carrier, or solvent, which preserves the finish liquid in the container and evaporates as the finish dries, and a binder, or resin, which protects the surface. Finishes may also contain additives to speed drying or provide fungicidal properties. All these elements contribute to a finish’s environmental impact. Solvents can be derived from petroleum-based or synthetic materials as well as from materials as simple as linseed oil or water, and can vary within a type of finish: some types of lacquer, for example, use water as a solvent while others use oil. The binder determines a finish’s function, durability, and category (lacquer, natural oils, shellac, and so on). Additives may be toxic, though not all are. Clear finishes vary in their durability and ability to protect wood from heat, water, and chemicals. Lacquer, shellac, varnish, and water-based sealers coat wood, forming a protective layer on the surface; natural oil sealers penetrate wood, prolonging the wood’s life but leaving the surface susceptible to scuffs and dirt. For a summary of the environmental pros and cons of the materials discussed here, see Green Home Guide’s Buyer's Guide to Clear Finishes. The binder in most lacquer is acrylic, which is synthetic, or nitrocellulose, which is derived from natural sources such as wood or cotton. Acrylic lacquer is more durable and better for floor coating, while nitrocellulose lacquer is more often used on furniture and decorations and can be touched up easily because it does not set in the same way as acrylic lacquer. While nitrocellulose comes from natural sources, its benefit is outweighed by the environmental and health impacts from xylene, toluene, and solvent manufacture and exposure. Since lacquer does not form as hard a coating as most types of varnish or water-based sealers, the wood is more susceptible to water and physical damage. Catalyzed lacquers, however, are very durable. Because lacquer usually has high solvent and VOC content and often contains the solvents xylene and toluene, conventional lacquer is not considered environmentally preferable. In fact, conventional lacquer is one of the worst clear finishes in terms of emitting VOCs into your home; only varnishes are worse. However, you can now find low-VOC, water-based lacquers that fall far below the EPA’s VOC limit for lacquer of 350 grams per liter (g/L) (see the Water-Based Sealer section below). Natural oil finishes are lightly processed linseed or tung oils derived from renewable resources—flax seeds and tung tree nuts, respectively. They are moderately durable compared to other finishes. Natural oils penetrate wood to protect it from within and so do not protect the surface as well as varnish or lacquer, but still offer moderate water resistance and are environmentally sound because they contain few additives and are less processed than most finishes. They are lower-VOC than lacquer and varnish, despite being mostly oil, because they cure by absorbing oxygen and hardening rather than by evaporating solvents and simply leaving behind a binder. However, these oils must be thinned with a solvent, which will increase the amount of VOCs released during application. When thinning, use as little thinner as possible to achieve an easily spreadable consistency. "Boiled," "heat treated," or "polymerized" linseed oil contains a metallic drying agent to cut drying time to a day. Raw linseed oil, without drying agents, can take a week to dry, so it is rarely used, though its manufacture is simpler and less polluting since it lacks metals. Tung oil cures fully in a few days so it does not require drying agents, though they will speed up drying times. Tung oil is a bit more water resistant than linseed oil. Few people are allergic or sensitive to these oils. Wood finished with natural oils is easy to touch up by simply rubbing in another coat every year or so, avoiding having to sand down the surface and reapply when areas start to fade, as is often the case with varnish. Check the material safety data sheet (MSDS) for lead and for the carcinogens arsenic, beryllium, chromium, cadmium, and nickel, and the probable carcinogen lead, which may be used as drying agents. Cobalt and zirconium are less toxic drying agents. Shellac is more environmentally sound than lacquers and varnishes and is suitable for floors that are not subject to much scuffing, heat, or moisture, as it is not very durable under these conditions. 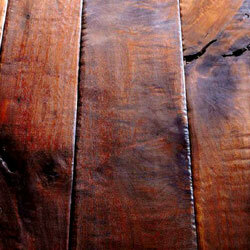 In high-wear applications shellac should be coated with a water-based sealer. Shellac’s natural resin binder, produced by the lac insect, is considered a renewable resource, and very few people are sensitive to the resin. Shellac uses ethanol, an alcohol solvent made from corn. During application, vapors from ethanol can irritate your eyes and respiratory system but they dissipate quickly as shellac dries. Shellac can also be made with methanol, a powerful toxin also known as wood alcohol. This is uncommon, but you should check the MSDS. Buying the correct amount to cover your surface is especially important, since shellac has a shelf life of only six months. Because shellac dries quickly, you can apply many coats in a short time—dust has less time to settle, which makes desirable results easier to obtain. Varnish is typically a mixture of a binder, commonly urethanes or acrylic, and drying oil, usually linseed oil, used on indoor surfaces. Urethanes are more expensive but more durable than acrylic varnishes. Varnishes are the best clear finish for resisting heat, chemicals, and solvents, and they are very widely used. Because varnishes use petroleum-derived and synthetic solvents that emit high levels of VOCs during application, varnishes are not considered environmentally preferable, but they are the most durable floor finish. During application and drying, which can take up to eight hours per coat, varnish emits the highest level of VOCs of the clear finishes discussed here. Achieving the proper finish will require three or four coats, each of which needs to dry and be sanded before the next goes on, exposing you to high VOC concentrations for least two days. Varnish is toxic to handle, and cleaning up requires harsh solvents that release more VOCs into your home. And the high levels of petroleum-derived solvent content mean the manufacture of varnish is environmentally damaging. On the plus side, once varnish has dried, its impact on air quality is only moderate. Varnishes are the longest-lasting finish, so you will not have to reapply them as often, reducing the frequency of your exposure to VOCs over time. The EPA has set VOC limits for varnishes at 450 g/L, though some states have recently stipulated that 350 g/L is the upper limit for all architectural coatings. VOC levels are listed on a varnish’s MSDS or Technical Data Sheet and are rarely much lower than required by law. For comparison, water-based sealers can easily be lower than 200 g/L, down to 50 g/L. Water-based sealers are environmentally preferable, and they continue to be improved, both in terms of better performance and lower emissions. We recommend them for their low environmental and health impacts, ease of handling and clean-up, and durability. Most low-VOC clear finishes use primarily water as a solvent, and acrylic or polyurethane as binders (the same as lacquer and varnish). Not all of the solvent is water, however. Glycol ethers, which are toxic, are still often used as solvents in small amounts. Because water-based sealers use fewer harsh solvents, petroleum derivatives, or other toxic substances, they avoid the environmental damage and pollution associated with the manufacture of these ingredients. Clean-up only requires soap and water instead of harsh solvents that affect indoor air quality. Most water-based sealers also dry quickly, allowing you to apply many coats in a day and reducing the time you are exposed to heightened VOC levels, but they also require quick and more careful application. When shopping for water-based sealers, look for a low-VOC product (less than 250 g/L). Many products achieve levels as low as 50 g/L. This information is displayed on the label or on the product's MSDS. The MSDS will also tell you if the sealer contains glycol ethers. If you must use a sealer with glycol ether, propylene glycol and ethylene glycol are less toxic types. Water-based sealers offer moderate water, heat, and solvent protection; while they are less durable than oil-based varnishes, they are more durable than traditional lacquers and most other finishes discussed here. According to Mark Knaebe of the U.S. Department of Agriculture Forest Products Laboratory, catalyzed urethane acrylics are the toughest water-based indoor floor finishes regularly used. "Catalyzed" means the sealer cures by chemical reactions rather than simply water evaporation; because of this, they are more difficult to apply but they provide very good protection. A new type of water-based wood finish has become available in recent years. It uses whey protein (a by-product of cheese production) as the binder. It is very durable and only contains 180 g/L of VOCs. For more details on this product, see this article from Woodworker’s Journal eZine. Vermont Natural Coatings’ PolyWhey Floor Finish was selected as one of the Top 10 Products for 2008 by BuildingGreen.com. When possible, use a water-based sealer or natural oil for your wood finishing project (see The Green Guide buying guide link below). For really high-wear floor or furniture applications that require a harder finish, be sure to look for the lowest-VOC finishes that are available. Consult this guide for a comparison of specific wood finishes, including natural oil-based and water-based products. Green Seal’s "Choose Green: Wood Finishes and Stains"
A report by Green Seal, an independent, nonprofit certification organization, providing background and selection criteria for clear finishes and stains. Green Seal's new (September 2009) environmental standards for stains and finishes are available here. Healthy House Institute article on Wood Finishes A good summary of the pros and cons of various types of wood finishes. "What You Need to Know about Wood Finishes"
Canadian Home Workshop’s guide to clear finishes, focusing on application. Green Home Guide's "Selecting Healthy and Environmentally Sound Stains"
For an in-depth discussion of wood stains, check out this article in our series on coatings in the home. The EPA's "An Introduction to Indoor Air Quality – VOCs"
This site provides more information on the sources and health effects of VOCs and indoor air pollution.